BTW - This is just stuff I pick up on by casually paying attention to a few online cycling news sites every few days or so. I'm no cycling expert, just an amateurish cycling and Tour de France enthusiast. THE END OF DOPING IN CYCLING IN SIGHT? Believe it or not, the revelations of a few dopers in this year’s Tour de France (Alexandre Vinokourov, Cristian Moreni, Iban Mayo) went a long way to drain doping of its viability even for the stealthiest of cyclists. It’s become harder and harder to dope under the radar (Michael Rasmussen left the TdF "guilty by avoidance" of pre-race anti-doping tests). Doping’s also become unacceptable to more and more cyclists and teams. High profile doping exposures have toppled some once-thought great riders (Ivan Basso, Tyler Hamilton, Jan Ullrich). I won’t be surprised if a few more recognizable riders are implicated and banned. In the long run, cycling is cleaning up its act in a strong move toward integrity. Let's see some American-oriented sports do the same (MLB, NFL, etc.). DISCOVERY CHANNEL TEAM SUNSETS. The team that Lance Armstrong built, that won the Tour de France 8 of the past 9 years, that won the Tour de France this year and placed two riders on the podium in Paris, will call it quits at the end of this season. Tailwind sports had U.S. Postal Service as its main sponsor until four years ago, when Discovery Channel picked up the $45 million + per year tab. Discovery Channel announced in February that it is ending its sponsorship and team leaders have been unsuccessful in finding a new American or international sponsor. So, the only American-based team in the elite Pro Tour cycling circuit is gone. Sigh! So, 27 of the world’s best cyclists, including a number of Americans, will be looking for jobs come October. HELLO, SLIPSTREAM! The good news is that another American-based team is on the horizon. Former top-notch cyclist Jonathan Vaughters, a Tour de France veteran, has been coaching and building Team Slipstream to European-level respect. He’s signed American Tour de France veterans David Zabriskie and Christian VandeVelde, along with Scotsman David Millar. Other internationally-respected riders are lining up. Importantly, Team Slipstream has established model anti-doping procedures and ethical guidelines that will likely become a model for all of professional cycling--something that is critical for the future of competitive cycling. 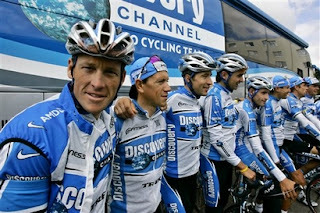 Team Slipstream may eventually fill the void left by Discovery Channel in ProTour competition. We may even see Slipstream at next year’s Tour de France! VUELTA a ESPANA, ANYONE? Anyone up for one more cycling epic this year? 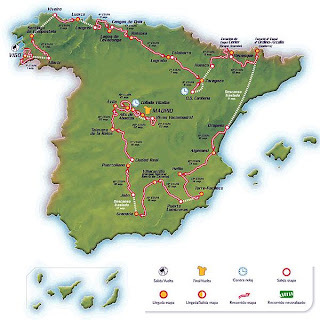 The Vuelta a Espana begins September 1st. That is, the Tour of Spain. 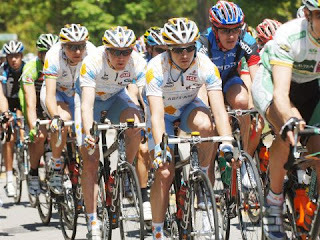 The triple crown of road cycling includes the Giro d'Italia (Tour of Italy), the Tour de France, and the Vuelta a Espana. All are three-week epics that include the elements of bike racing we witnessed in the Tour de France—grueling time trials, breathtaking breakaways, epic climbs, harrowing bunch sprints, terrible crashes, incredible beauty, and great fans. All are ultimate tests for the complete cyclist, pushing the limits of human capability. Unfortunately, the tours of Italy and Spain are not available on American TV. But they can be followed with online TV (http://www.cycling.tv/) and by live minute-by-minute updates on http://www.cyclingnews.com/ or http://www.velonews.com/. Also, unfortunately, the Giro and Vuelta are somewhat less of an international field; they tend to feature and favor sons of their own respective nations. SPAIN IN SEPTEMBER. Historically, the greatest winners of the Tour de France also raced--and won--the tours of Italy and Spain, riders like Bernard Hinault and Jacque Anqetil. But as the demands of today’s racing have increased (speed averages, degrees of difficulty), the toll of riding all three epics prevents most top riders from attempting all three. Lance Armstrong never attempted to win the tours of Spain or Italy, focusing, instead, only on the crown jewel of cycling. I wonder if Alberto Contador, a son of Spain and this year’s Tour de France winner, will try to ride and win the Vuelta? Find out more about the Vuelta here or go to my Tour de France blog for links to the Vuelta a Espana: http://tdf-bikehiker.blogspot.com/. I don't think I'll blog the Vuelta daily, but I hope to offer a few updates and highlights, particularly if an American is among the contenders. SEPTEMBER: MY OWN RETURN TO BIKING. Personally, I hope to be back on my own bike in September. All summer, I have been jealous even of kids on banana-seat bikes in our neighborhood. But an MRI on September 5 will determine whether or not my torso torture chamber--er, brace--comes off and I am cleared to move toward physical re-conditioning. I have a goal of riding the Hilly Hundred in October, so that will just give me about a month to tune up. The Hilly is not a race, of course, but it is 100 miles of plenty of heart-pumping climbs around southern Indiana. It's a fun ride over two days and manageable by most half-serious cyclists. Get in on it at http://www.cibaride.org/.